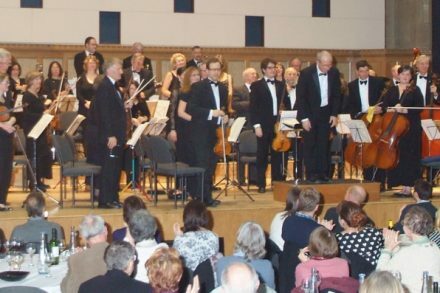 The Sheffield Chamber Orchestra (SCO) was formed in 1950 by a group of music lovers who enjoyed their music making and wished to share that enjoyment by giving public performances. It has grown into a standard classical chamber orchestra with a full range of wind instruments, together with horns & trumpets - in total around 44 players. - A Winter Gala of popular shorter works, held in the Firth Hall. Invariably sold out months in advance, the audience are seated cabaret style at large round candlelit tables for groups of up to 12. A licenced bar is open throughout the evening and the concert provides a great opportunity for friends and families to relax together in beautiful surroundings and enjoy the performance. - A spring Masterworks Concert to showcase great classical works. This is again held in Firth Hall and for the past years the SCO has worked with the members of Ensemble 360 (Tim Horton, Ben Nabarro, Adrian Wilson for example) who take centre stage to perform the great concertos. - A Summer Festival concert, on which our focus is to collaborate with and promote Sheffield’s many exceptional young musicians ̶ our musical future. The SCO is comprised of proficient amateur musicians (Grade 8 standard and above with substantial playing experience), and benefits from the professional leadership of Ralph Dawson, and of our Conductor and Musical Director George Kennaway. Rehearsals are held on Tuesday evenings at High Storrs School (7.30 - 9.30pm) and there are generally 7 rehearsals preceding each concert.